The Western Cape Department of Agriculture, Swellendam Municipality, Casidra and various other stakeholders commemorated World Food Day on 16 October 2014 in the small village of Suurbraak where poverty is rife. World Food Day is an international day of action against hunger celebrated during the month of October. It has since then been observed by millions of people around the world who come together to declare their commitment to eradicate hunger in our lifetime. When it comes to hunger, the only acceptable number in the world is zero. The theme for this year’s World Food Day was, ‘Family Farming: Feeding the world, caring for the earth’, and the Minister of Economic Opportunities in the Western Cape, Alan Winde, handed over 108 household gardens and seven community gardens to recipients of Suurbraak’s community village. This record number was more than double the number of food gardens that were handed over to other communities during the previous year. This achievement was made possible by several partners, such as the National Department of Agriculture, Forestry and Fisheries (DAFF), the Department of Rural Development and Land Reform, the Department of Health and Casidra which acted as an official implementing agency for the Western Cape Department of Agriculture (WCDoA). 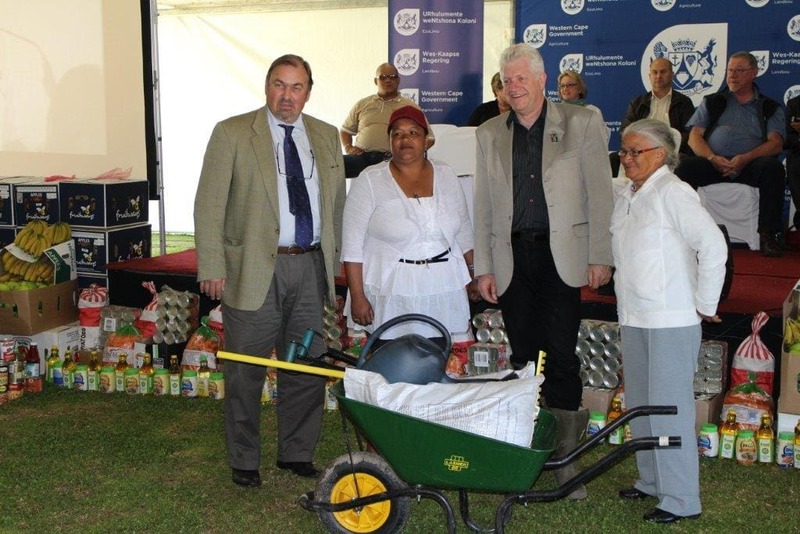 Furthermore, other organisations such as the Breede Gouritz Catchment Management Agency donated items towards the establishment of some the gardens and SAB Miller sponsored three community-driven projects. Minister Winde urged the Suurbraak community and its leaders to ensure that the food gardens are cared for and expanded. He said, “We are all committed to make contributions towards food security. If cared for, food gardens play a crucial role in ensuring that families have a sustainable and healthy source of nutrition”. Casidra’s Project Managers, Michael Mackenzie and Neil Connan, both worked hard to ensure that this celebration was a success. “Our role as Casidra, is to ensure that gardens and all other necessary equipment were successfully implemented and ready for this big day”, said Mackenzie. Apart from the food gardens, community projects including a nursery, irrigation and fencing were handed over during the event. All these projects in Suurbraak already have secured markets and a local food stall provides visitors in the area with a choice of fresh vegetables and herbs. Minister Winde handed a food “mountain”, to the value of R20 000, that was made possible by the contributions from WCDoA staff and Elsenburg College students as well various retailers and NGOs, for distribution within the community.